This guide has already said more than once, "Population is power." Now is a good time for an example of why that's true. 5 RP all on its own. 1 extra RP per scientist. Since your scientists were producing 3 RP each before you built the Research Lab, they are now producing 4 RP per scientist. So a Research Lab plus 1 scientist will produce 9 RP, while for example a Research Lab plus 4 scientists will produce 21 RP and with 10 scientists it would produce 45 RP. with 1 scientist, a total of 11 RP. with 4 scientists, a total of 29 RP. with 10 scientists, a total of 65 RP. Similarly more advanced research buildings produce a larger increase per scientist. Looking at industrial production and the effects of an Automated Factory, the first industrial building in the tech tree, the figures for construction points work out in the same way, except for one thing - at this low tech level you have no pollution control technologies. So an Automated Factory plus 4 workers will produce 18-19 PP (production points) instead of 21, because 2-3 have to be spent on cleaning up pollution (unless your race is Tolerant; then you get the full 21 PP). Once you get adequate pollution control, the construction figures work very like the research figures: adding a few more people increases your output significantly. Money is usually a constraint in the early game, and growing your population fast increases your income fast. This is usually essential, so that you afford the maintenance costs of increasingly advanced buildings. The same principles apply in Average and Advanced start games - more advanced facilities may be available, but all except 1 research building, 1 industrial building and 2 agricultural buildings require people. Natural population growth is fastest when a planet is about 50% full. So maximizing natural growth would mean moving people out of your most populous and usually most developed, most productive planets. Buildings have maintenance costs, and young empires can't afford to waste money. That means you don't want buildings that are used by only a few people, you want to maximize the number of people using each building. Living Space L = (max_pop - pop + 1) / (max_pop) ...ie. a linear percent between 100 and 0 of how much potential is left for growth. Efficiency ef ~= L ^ (1 + L) ...ie. a decaying exponential curve that furnishes a diminishing percent with each additional pop. 40 56 72 88 104 120 136 152 168 184 200 216 232 248 264 etc.. However, since for some races (such as UniProd+1) or on Mineral-Rich planets with high max_pop (whether due to size, type, tolerant or subterranean traits) each new worker increases the value P faster than efficiency declines initially, sometimes you can see higher growth rates with 2 or more population set to 'Housing'. It is easy to see from the above that industrial buildings greatly affect P and hence, along with efficiency, greatly influence population growth rate. Since researching industry tech is pretty much a given, it follows the "Pop-1 Housing Colony" growth strategy can work for races that don't research Cloning Center. These growth rates are subject to both production penalties due to gravity/morale and/or racial pop-growth picks (+/-50% growth, +100% growth). You start a pre-warp game with no technologies that boost population growth, but you're doing everything else ( farming, production, research) with zero or minimal help from automation, so you urgently need more pairs of hands (or whatever appendages your race uses). Fortunately there's a very effective zero-tech way to increase population growth. You can order a colony to "build" Housing, which directs its industrial output into population growth. You can manage Housing from the Colony List. Housing works fastest in colonies with a population of 1, so it does not divert a lot of your population from research and construction. A population 1 planet "building" Housing with no industrial buildings and no racial or planetary industrial bonuses or penalties will produce a new unit of population eventually after more than ten turns. This means you should check every couple of turns for Housing colonies with more than 1 unit of population, and move the excess to production / research / farming elsewhere. That's a win-win deal: you get more efficient Housing as well as increased production / research / farming output. The easy way to do this check is via the Colony List: click the "Producing" label at the bottom and the List will sort by what each colony is producing. Housing is always at the bottom of the listing, so scroll to the bottom. All your Housing colonies are grouped, and it will be easy to spot any that have more than "person". Then you can use the Colony List to move the excess to where they're needed. MOO II wasn't designed for Windows, so it doesn't use the common "drag and drop" technique. In fact it's even simpler: click a "worker" icon (in the "Workers" column) and the cursor will change to show the icon; move the icon to where you want the "person" and click. When your empire gets larger you may need to scroll the Colony List to find the destination you want; and you can use the scrollbar while the cursor is a "person" icon. Quite often you will want to move the "person" to another planet in the same system; but the destination will be making something else. You can make it easy to find the destination by clicking the "Name" label to sort the List by names of planets (they are always star name followed by a number) so that planet in the same system are grouped together, then scroll until the planets in that system appear. 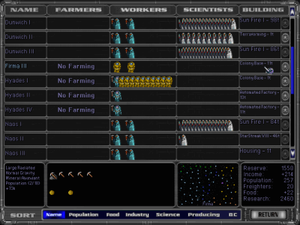 All this time the cursor is the "person" icon, but the game software won't drop the person until you click in the "Farmers", "Workers" or "Scientists" box of a colony. Using the Colony Screen to move colonists within a system. It's usually easiest to move colonists by using the Colony List, but occasionally Colony Screen provides an easier way to move colonists within the same system. For example if you're using the Colony List to see which Housing colonies have spare population, the list is sorted by what each colony is producing and it's hard to find other colonies in the same system. But if you click the Housing colony's name in the Colony List, you display the Colony Screen; then you click a colonist and then click the destination planet's icon in the top left corner of the screen. Afterwards you can return to the same place in the Colony List by clicking the "Return" button or pressing the ESC key. do not need Freighters and take effect immediately if within the same system. "Take effect immediately" means that when you click "end turn", the transferred people are working in their new locations and possibly new jobs. take a few turns if between separate systems. Since you need 5 Freighters per million colonists (each population icon represents one million people) and each Freighter costs 0.5 BC per turn that it's in flight, you have to watch your finances carefully when transferring people between systems in the early game, when you have no financial technologies. Note that just 1 puny warship can blockade a system, preventing Freighter movements into and out of the system. If you transfer population to another system and that system is blockaded when the Freighters arrive, the people in transit die. Try to avoid transfers to systems that are at risk of being blockaded: there are often safer destinations; even if there are not, at least you don't waste the cash spent on the transfer. Housing scales with production. If you can build an automated factory, it should be on the build list immediately. Instead of moving population away from 1 Population colony, you should move 1 population TO the colony, so that you can have twice the production to churn out that first building. Once you have the automated factory up, you can choose to build housing (which is much better than the original 1 Housing colony strategy), or build more production/morale buildings. Also if you want to get your colony up and running, consider completing the buildings via buying. It is all about opportunity cost here. If you have only 1 colony in a system, move your mouse over its line in the Colony List and the current and maximum population will be shown in the information box at the bottom left of the screen. 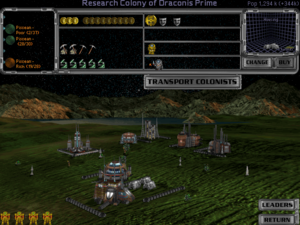 If you have more than 1 colony in a system, it's often easier to click the name of any of these colonies; this displays the Colony Screen, which shows the current and maximum populations of all these colonies in the box at the top left. See the notes above about Freighters. It is also important to remember that, at any given time, you can only have a maximum of 25 people "in transit". If you try to move more, then a message will tell you that you reached the maximum number of people in transit. People over the limit will not have been moved and will still be selected, and they can be moved only to a colony in their original system. If this occurs to you, and you do not remember from which system they originally came from, just click the Return button and these people will automatically be returned to their original colony, then come back into the colony screen. To help manage moving colonists when at or near the limit, check the Turn Summary will tell you how many settlers have reached their destination (you need to make sure the game settings are set so unimportant turn summary events are included). When you build a Cloning Center, a colony's population growth increases by 100k per turn(each farmer/worker/scientist icon represents one million people). This an "achievement", i.e. you get the benefit without producing a building: the natural growth rate of all your colonies increases to 125% of the standard starting value. Another achievement that increases the natural growth rate of all your colonies to 150% of the standard starting value (and replaces Microbiotics if you got that earlier). Universal Antidote is so high up the Biology tech tree that it is not often seen in competitive games. There are useful alternative technologies at each of these levels, so if your empire is not Creative you will have to decide which one you want, and hope to get the others by spying, conquest or trading. Eventually more of your colonies will become full, and your population growth will grind to a halt if you haven't prepared for this. You could create more colonies, but by this time other empires are probably in a similar situation, so wars for territory are very likely. You could make ships to defend new colonies, but ultimately defense does not win games; your fleet should be as free as possible to attack. Fortunately there are technologies that resolve this dilemma. These low-tech buildings (80 RP; 60 PP; maintenance 1 BC) increase the population capacity of a colony by 2. If your race is not Creative you have to choose at this tech level between Biospheres and Hydroponic Farms (automated farms that produce 2 food; 60 PP; maintenance 2 BC), but Biospheres are almost always the better choice: they cost less to maintain (at this stage most empires still have to be careful with money); on a good planet you can use 1 of the 2 extra people for farming and the other for research or production. This technique is only beneficial if you militarily assimilate either a Subterranean or Tolerant culture (ie. in vanilla MOO2 either Sakkrans or Sillikoids) and you did not start with either of these racial picks. Strictly speaking, the Alien Management Center by itself doesn't increase your population limit. It does however negate the morale penalty incurred when mixing such alien populations in with your own, as they will expand your maximum population limits by 2x or 1.5x respectively. These extra population slots, however, can only be filled by the alien race. This technique is only beneficial on planets occupied by non-Subterranean or non-Tolerant races. The Androids themselves are considered "tolerant" and thus expand the maximum population limits on planets where they are present in the same way as a Tolerant alien race would. These extra slots can only be filled by androids (you will see 0 population growth on a planet, but there will still be slots free for more androids). They can be moved around between planets in the same way as normal colonists. Their use has some drawbacks, however. as they require 1 PP/turn maintenance rather than food and they generate no tax income. But in general, when used correctly both the Android Worker and Android Scientist can greatly expand your economic output. This very advanced achievement (6000 RP; no construction or maintenance) adds 5 to the maximum population of all your colonies (except any that you captured from empires that already had Advanced City Planning). It's so late in the tech tree that it will not appear in many competitive games. As usual if your race is not Creative you have to choose between this or Star Fortress or Heavy Fighters. Terraforming (1150 RP; 250/500/750 PP; no maintenance) and Gaia Transformation (7500 RP to research; 500 PP to "build"; no maintenance) enable you to improve planets in ways that generally increase both farming efficiency and population capacity. Terraforming is the only tech at that level, so even Uncreative races will get the opportunity to research it. Gaia Transformation is 1 of 3 at the top of the Biology tech tree, so non-Creatives have to make a choice; but competitive games don't usually last long enough for it to matter. Toxic planets can't be terraformed at all. Radiated planets can't be terraformed until they have a Radiation Shield, or one of its more advanced and expensive relatives, to convert the planet from Radiated to Barren. Radiation Shields cost 900 RP, 80 PP, and 1 BC maintenance; non-Creative empires have to make a fairly difficult choice at this level as Class 3 Shield is the first ship shield that's worth having. After the planet has been terraformed at least once the shield is no longer needed and can be destroyed to reduce costs, but if the planet has not been terraformed yet, it will revert back from Barren to Radiated. A planet can be terraformed up to 3 times, stopping when it's upgraded to Terran; a planet's first terraforming costs 250 PP, its second costs 500 PP and its third costs 750 PP (so the full cost of terraforming 3 times is 250 + 500 + 750 PP = 1500 PP, about the same as 3 Colony Ships or a very high-tech Battleship with all the most expensive equipment). When you're playing a competitive game rather than just showing off against the AI(s), you may want to terraform each sub-Terran planet only once, and even then you may only want to terraform where you gain the most in population capacity. Of course there will be exceptions, for example a large or huge Rich or Ultra-rich planet with good pollution controls will complete even a 3rd terraform in a few turns, and the extra population capacity will enable it to become a monster ship-builder that produces high-tech Battleships in 3-5 turns. Barren becomes Desert if the planet is in one of the 2 inner orbits (nearest its star), Tundra if the planet is in one of the 2 outer orbits (furthest from its star) and either Desert or Tundra (50% chance of each) if it's in the middle orbit. The orbit numbers are not simply the relative positions of the planets,as some orbits may be empty; for example occasionally you'll see a system with only 1 planet but in the outermost orbit. Terraforming Barren planets does not increase population capacity except if the inhabitants are Aquatic and the result is Tundra, which counts as a "wet" planet. Tundra also grants 2 food per farmer for Aquatics, while Barren does not allow farming. Desert becomes Arid. This is one of the biggest increases in population capacity, and applies to all types of race. No changes to food production. Tundra becomes Swamp. This is no gain for Aquatics, and other races only gain significantly if the planet is Large or Huge. Increase in food production by 1 for non-Aquatics. Arid becomes Terran. Only Large and Huge planets gain significant extra population capacity, for all types of race. Increase in food production by 1 for non-Aquatics and by 2 for Aquatics. Ocean becomes Terran. This is no gain at all for Aquatics but the largest gain for other races. No changes to food production. Swamp becomes Terran. This is only a small gain for Aquatics but a huge gain for other races. Increases the food production by 1 for Aquatics. Significant for "normal" and Subterranean races only on Medium and larger planets. No population gain for Aquatic or Tolerant races. Increases food production by 1 for non-Aquatic races. This page was last edited on 23 August 2018, at 21:20.